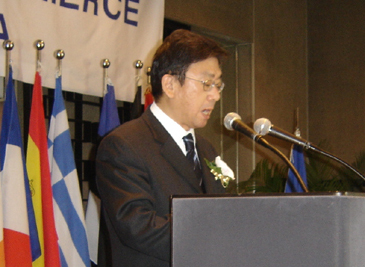 Lee Min-Hee, director general of the Immigration Bureau of South Korea's Ministry of Justice, delivers a speech at the luncheon seminar organized by EUCCK President Frans Hampsink at the Grand Hyatt Hotel Feb. 24, 2005. The South Korean immigration office has introduced new laws for businesspeople who are interested in investing in Korea and at the same time staying and working in the land of the morning calm. "I do well understand that as businesspersons, you put your highest concern on the value of customers, because the customers themselves, to you businessmen, are the 'raison d'etre. I understand this. And I dare to say that I consider you my most important customers. 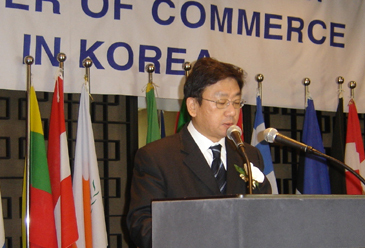 And as the chief executive officer on immigration policy area, I promise I will do my best to leave you impressed with our service," said the director general of Immigration Bureau of South Korea's Ministry of Justice, Mr. Lee Min-Hee, in a luncheon speech held at the Grand Hyatt Hotel in Seoul on Feb. 24. 2005. Frans Hampsink, president of The European Union Chamber of Commerce in Korea (EUUCK), welcomed everyone for the seminar titled "Korean Immigration Policy and Enhancement of Business Mobility." 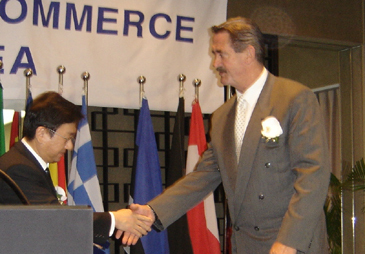 EUCCK was formed by a group of individual business executives from various EU companies based in Korea, with initial financial support from the European Commission in February 1986. The purpose of the chamber is to help in any possible way in developing trade, commercial and industrial relations between the EU and Korea. The chamber paves the way for and fosters contacts between interested business circles of the 25 EU member states and the Korean Peninsula. 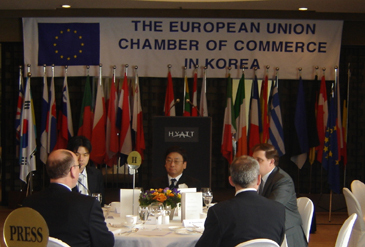 The European Union Chamber of Commerce in Korea, a non-profit organization, is made up of around 800 members from the EU, local as well as the overseas business community. 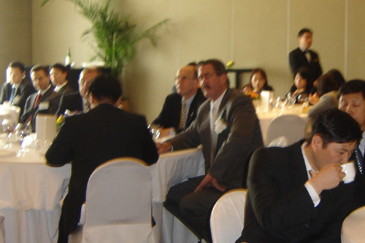 Various types of guests from the different organizations were present at the luncheon seminar, such as the secretary general of EUCCK, members from other chambers of commerce in Korea, and members from different multinational companies. 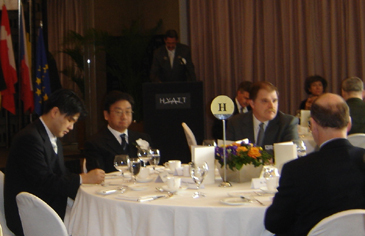 Before presenting the speech, Mr. Lee Min-Hee joined the lunch with the distinguished guests, dining on a delicious menu. EUCCK President Frans Hampsink (center) and other guests participate in the luncheon seminar held by him. Addressing to the president and secretary general and other distinguished guests, as a key speaker Mr. Lee Min-Hee said, "I should emphasize the importance of my appearance today as an invited speaker on the topic of ' Korean Immigration Policy and Enhancement of Business Mobility.' Today's policy is on the larger global society. And I feel a great sense of responsibility for the importance of our immigration bureau's role in the community of nations." As a scholar from the different universities both from home and abroad, Mr. Lee pointed out some important issues related to immigration procedure of Korea. He said, "The Korean Immigration Bureau is dedicated to catching up to global trends as well. With this aim, we research and review related international trends, collect and analyze the best practices of other countries and identify the applicable global standard. This standard can be referred to in our policy development and be realized in a policy combining Korean values." — Foreign investors who invest more than 5 million US dollars in Korea can be eligible for applying for Permanent Residence Status (F-5) with no minimum residence requirement while investing more than 500,000 US dollars will be subject to fewer regulations for Permanent Residence Status. Most importantly, a foreign investor or an executive of an investing entity who invests more than 500,000 US dollars can have a foreign housemaid by providing legal grounds for hiring. — The collection of fingerprints has been abolished with the aim of enhancing human rights. — E-7 visas for teachers in foreign schools, and D-7 visas for intra-corporate transferees, are now possible without leaving Korea, while spouses of diplomats can get work permits without leaving Korea as well. — Operating a mobile Immigration office is now a new step, which will serve foreign residents in advance and much faster. — More types of immigration applications can be now submitted in the Sejong Ro immigration branch office, which is located near the Government Complex Sejong Ro, for the purpose of providing better access to immigration services. — Deployment of immigration experts to the Seoul City government foreign investment center to offer support to foreign investors. — There is a Premier Inspection Lane in Incheon International Airport for foreign investors, but it is limited for D-7 permit holders. In recent years, the situation concerning immigration affairs in Korea has dramatically changed. Every year, cross-border movement increases 20 to 30 percent. There are now more than 750,000 foreign residents, and among them 400,000 foreigners are working as laborers including 180,000 illegal residents. 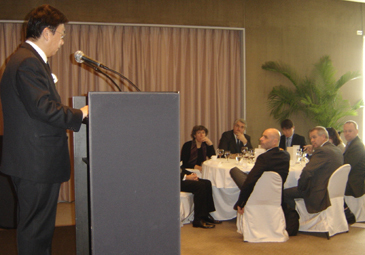 Director General Lee Min-Hee delivers a speech in front of the guests during the luncheon seminarr held by EUCCK in Seoul. Korean immigration is now making the balance between enforcement, such as border inspection and immigration crackdown, and privileges, such as offering immigration services and hospitality. Mentioning the integrated international community, Mr. Lee said that despite an easier approach to cross-border movement, such as enhanced cross-border access through communication and transportation, the systems and regulations in each country have not yet fully accommodated such a trend. However, for developing a Free Trade Agreement (FTA) from one country to another, Korea pursues not only the free movement of goods, but also the free movement of people. 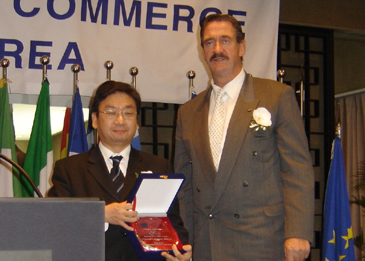 He went on to give some examples, such as the Korea-Chile FTA agreement, which has produced considerable benefit in terms of business mobility through the FTA, and the operating of the Asia Pacific Economic Cooperation (APEC) Travel Business Card, which allows APEC businessmen freer cross-border movement. Balance on consensus is a must to have the maximum benefit of immigration as opposed to illegal migrants and smugglers. EUCCK President Frans Hampsink (back on the podium) speaks while Director General Lee Min-Hee (second from left) and other guests are listening at the luncheon seminarr held by EUCCK. However, with the foreign investment, the economy of Korea is now getting benefited to some degree, but this also causes dissatisfaction for potential young Korean job applicants. The task of combining these contradicting values is not easy, but Korean society will have to overcome this challenge. Mr. Lee added that there is a structured international community on which an agreement has been made between Germany and Korea on the ministerial level, so that both countries nationals can enjoy more convenient and facilitated services. South Korea will endeavor to make this kind of agreement with other countries, especially with European countries gradually in the future. Mr. Lee ended his speech by saying thanks to everyone for their kind attention and wished that he would like to serve more on behalf of his office. After his speech, Mr. Lee answered some of the questions related to that subject. As a vote of thanks, EUCCK President Frans Hampsink said that the EUCCK would like to have a more convenient facility for the enhancement of business mobility, and also emphasized the need for further agreements with the member countries of EUCCK, like the agreement with Korea and Germany.